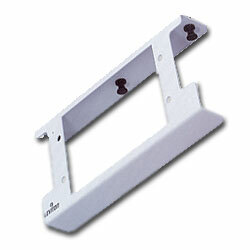 The Multi-Media Adapter Bracket provides a mounting point for mounting plates inside the Structured Media Center. The bracket supports any combination of two 6-pack mounting plates, which accommodate SC, ST, FC, MT-RJ, BNC, F, and all QuickPort connectors. Snaps easily into any of Leviton's Structured Media Centers with push-pins. Mounting Plates with BNC and F-Connector adapters available for easy video connection. Mount any two 6, 8 or 12-pack mounting plates in any Structured Media Enclosure. Supports the following adapters: BNC, F-Connector, ST, FC, SC and MT-RJ Fiber Optics, and any QuickPort Connector, including Banana Jacks, Speaker Binding Posts, RCA, S-Video, Voice Grade, and Category 5, 5e or 6.